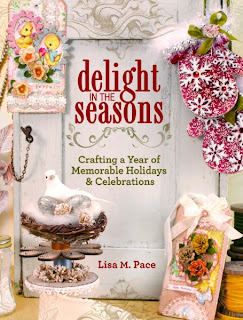 I loved Lisa M. Pace's book Delight in the Details. Delight in the Seasons is just as good. 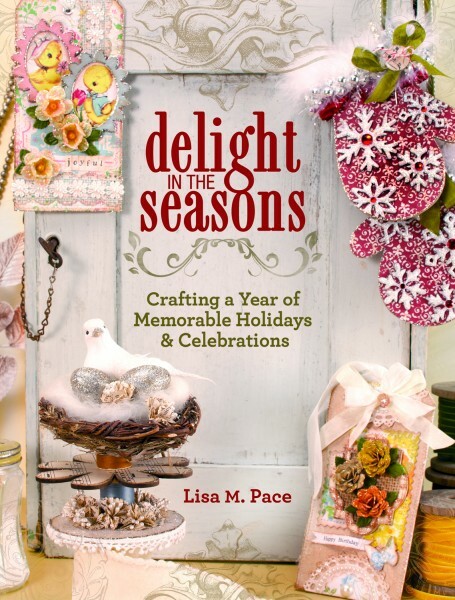 It's a mixed media techniques book with a seasonal theme. She covers all sorts of great embellishment ideas. Each project is to illustrate the use of one technique that can be used in all sorts of ways. It's richly photographed with both in progress pictures and the incredible finished projects. If you're a scrapbooker, a lot of these techniques will work to create wonderful pages and album covers. If you're more interested in mixed media decorations and gifts, you'll get ideas for those as well. There are some great pieces for putting on a mantel or shelf. Techniques include various ways to work with chipboard, embroidery, air dry clay, ultra-thick embossing enamel and modeling film. Lots of great accents create the details part. You don't need to be able to draw or sculpt to create art. The techniques are simple enough for anyone to do, the art comes in how they are combined. It's gorgeously inspirational, and you can imagine ways to mix it up, so the delicate chip board cameo accent on a card becomes instead, a brooch that's a gift for a friend. The embroidery technique to create a felt banner can be used instead to create a bunting. There are fabric roses, ways to alter die cuts, and all sorts of glitter and shiny accents. The instructions are clear and easy to understand. While each project focuses on one element, the finished projects have a list of the supplies used to create them with the companies listed to make finding components a lot easier. The projects have a lot of texture, visual interest and sparkle. I love glitter and love seeing it used in tasteful ways to give projects that something extra. My favorite project is probably the tart tin ornaments. She shows them as Christmas ornaments, but I’m thinking as little dioramas that can be displayed all year. I also love the metallic edged chipboard letter. Used in a masculine page layout in the book, the same technique could be used on other shapes to create pieces that look like cloisonné . At the end of the book is a short gallery for more inspiration, using many of the same techniques shown in the book. One of my favorite pieces is a patriotic star that can be hung on a wall or put on a base to put on a shelf that uses bottle brush trees and her method for dying them. There is also a good resources list, and a complete index to find things fast. This is as good as the first book. Her examples may be seasonal, but the techniques themselves can be used in so many ways. Published by North Light Books.